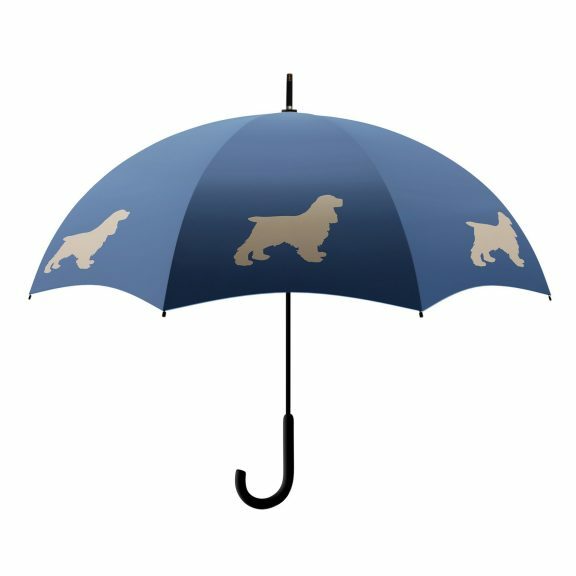 This cheerful Cocker Spaniel umbrella is perfect for any enthusiast, you’re sure to be the envy of everyone in the rain! Introducing this cocker spaniel umbrellas. Featuring a brilliant deep blue with stylish beige spaniel silhouettes on its 95 cm wide polyester canopy. This brolly also boasts a length of 86 cm. This walking style umbrella really is both functional and fun. Featuring an auto-opening system, 8 strong and flexible fibreglass ribs, 10 mm steel shaft and a slim black crook handle, this awesome accessory will keep you dry in a storm. Ideal for any dog lover and umbrella enthusiast. Why not treat yourself today? Not the umbrella for you? Check out the rest of our range of art umbrellas!